When trying to optimize your site for speed, you really want to remove unused CSS JS files in WordPress . With WordPress sites using a lot of plugins, when you try to optimize page loading times you’ll soon hit a roadblock. You got a reliable and fast host, enabled caching, optimized your images and removed any plugin that you don’t use. Next on the list is to optimize or remove unused CSS JS files in WordPress. After the new redesign a few months back, I’ve made it a personal quest to limit the number of CSS and JS files here at Cozmoslabs. Why do plugins load so many CSS JS files? it makes a lot of sense to invest a bit of time to remove unused CSS JS files in WordPress. What this does is it loads the style.css and filename.js sitewide, regardless of the fact that you’re using a particular shortcode on a single page or a particular widget on a particular custom post type. There’s no way to chose where that particular CSS/JS file gets loaded. So it makes a lot of sense to invest a bit of time to remove unused CSS JS files in WordPress. 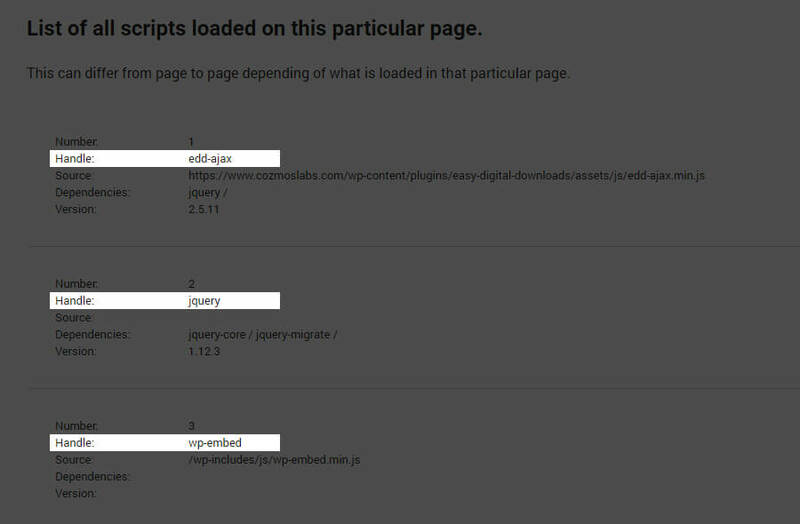 In order to remove unused scripts, we should first find our what exactly get’s loaded by our theme and plugins. One can do that simply by looking at the source code, make a list of files and then search in each plugin where exactly they get loaded. But that’s boring and there are much better solutions. First thing first, we’ll create a simple plugin that will host all of our code. * Description: Filter particular scripts and style to load in posts or pages that don't need it. Before we can remove unused CSS JS files in WordPress, we’ll first look at what get’s loaded. If you do a var_dump of both global files in the front-end, you’ll be able to see all the registered scripts (by plugins, themes and WordPress it self) as well as the ones currently loaded on our page. We’re mainly interested in the ones that get loaded. We’re hooking into the wp_print_footer_scripts hook with a very high priority to make sure all scripts finish loading before listing them. Also, this listing gets displayed only if you’re a logged in administrator. So your users or search engines will never see the listing. There are two extra functions that we’ll need to create. The wra_print_assets and wra_asset_template. dependencies – some files require other libraries, like jquery. Going forward, we’ll only need the handle of the CSS/JS files, however it’s nice to see this information listed to get an idea as to why some files are loaded. // This improves the resolution of gravatars and wordpress.com uploads on hi-res and zoomed browsers. We only have gravatars so we should be ok without it. // download monitor is not used in the front-end. // this should not be like this. Need to look into it. The really cool part of doing it like this is that you can use WordPress conditional tags to target a particular page or an entire custom post type. This gives us the flexibility we need to load our CSS/JS files exactly where they are needed. Sometimes scripts are added differently. The most common way would be to simply output the script or style tag directly in the header or footer. In our particular case, when removing unused CSS/JS files, one of the scripts was jetpack.css that for some reason was added in a particular way that wp_dequeue_style() didn’t work. * This is the hack to concatinate all css files into one. That’s about it. You can copy / paste the entire plugin from here and make modifications to it to better suit your WordPress site. Plugins load CSS/JS files globally for a variety of reasons. The main reason is that as a developer, there’s no standardized way of finding out if your shortcode is used in a page or not. So we load all assets globally. Also, it’s what WordPress.org recommends you do on the Codex as an example. With so many examples of loading scripts globally, it’s easy to understand why almost any WordPress site loads 15+ resources for each page, when only needing a a few of them. We’ve been using this technique on almost all our plugin assets for quite some time. If you want to remove unused CSS JS files in WordPress is really not that complicated. The bigger issue here is the way assets are added in plugins and themes, a lot of them being added globally regardless of whether they are needed or not. Other solutions to this problem can include combining assets, but even then, having a large CSS and JS file will slow down the loading time of your WordPress site, particularly on mobile devices because it has to render all those CSS files and execute all that JS code. Content delivery networks also help, but you’re still loading unneeded resources. I can’t think of an automated solution since each site is different, however there are plugins like WP Asset Clean Up. They don’t have the flexibility to target entire custom post types for example, however it’s a lot easier to use for non technical users then writing your own conditional rules. If you have other suggestions on how plugins can load CSS/JS in a more mindful way and not globally, I would love to have your input in the comment section. Regarding your issue with the Jetpack actions you’re unable to remove… These are added as methods of a class instance, so to remove them, you need to get a reference to the class instance first. Thanks for this tutorial. Exactly what I was looking for to get my site faster. I think “wp_deregister_script” is not needed, dequeue is enough and safer. You can also use “__return_false” function instead of making your own function which returns false. Cool. Thanks for the suggestion! There’s actually no need to create a global variable (and you shouldn’t) if you want to only load scripts/styles on pages where the shortcode is used. One method is to use wp_register_script() to register the script in the wp_enqueue_scripts hook, and then to use wp_enqueue_script(‘script-hook’) in the plugin callback. The script will then only be loaded if the plugin callback is called. What is needed is a campaign to get every plugin owner to improve their plugins so that scripts and css files are only loaded if they are going to be used. With http2 combining multiple static files into one is no longer necessary and a bad idea. However, your point about the processing overhead of unused CSS and JS files is valid. to see this web site oon regular basis to take updated from hottest information. I Used Genesis Child Theme. I have Many Problems Of Java Script & inline CSS. I am curious, where will the debug message gets output? Is it to the browser console? No. Directly after your footer if you’re logged in as an administrator. Where should I save this file. I mean the path? I have installed a plugin unused assets cleaner but it not work properly… is there any plugin to remove unused css and js codes…? Fantastic plugin concept, this is going in my WP performance tool belt. I could only find partial snippets on Stackoverflow which addressed this unused asset issue. So thanks Cristian! I think I found a script that can’t be removed using the methods outlined in this article, and I would be curious to hear your feedback. I’ve been trying to deregister/dequeue an asset from the Visual Composer page builder plugin, as it is causing some render-blocking and is also performing a non-performant animation right at page load. But it is never enqueued as far as I can tell. When I deregister and dequeue it, it is removed from the list of assets displayed below the footer, but when I view source the file is still being loaded and it is still running on page load.